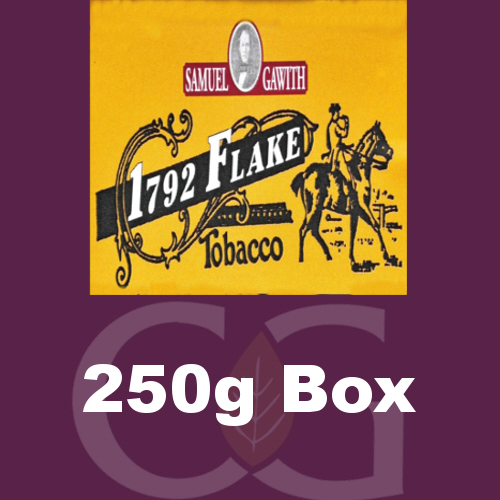 Following recommendations from others after my enjoyment of SG Navy Flake, I was then encouraged to try SG 1792 Flake. The flake is dark and smells very similar to SG Navy Flake with the notable omission of alcohol in the nose. I rubbed this down and allowed it to dry for several hours and then smoked it in my Peterson Derry Rustic Straight 106 Pipe. This is a strong tobacco flavour from the start, it is similar to SG Navy Flake but with the alcohol taste removed. It is lovely and strong (assuming you like the taste of tobacco) and probably one of the purest pipe tobaccos that I sampled. It was slow burning (3/4 of the bowl lasted 1 hour and 15 minutes) but I enjoyed it so much I smoked every last drop of tobacco in the bowl. It was strong in flavours but gave no bight to the tongue or the back of the throat. After lighting it required two more relights (nothing to write home about). It reminded me of sitting in a room with a peat fire burning, brought back memories there. The smoke it produced was thick and to my nose pleasant, but to a non smoker probably would have been quite offensive. The smoke output was quite large in volume and burned consistently throughout the duration of the pipe smoke. Overall I loved this pipe tobacco, but it is certainly not for everyone. I personally think that the Navy Flake edged it slightly as I enjoyed the notes of alcohol in the taste, but other than that I couldnt separate them on taste and enjoyability. Overall an excellent smoke that Im glad I decided to sample. If you like a full flavoured and full bodied pipe tobacco then I highly recommend this. After reading a few online reviews I would say ignore the horror stories online and decide for yourself.